1940s Footed hobnail pillow fan vase by L. E. Smith glass company. 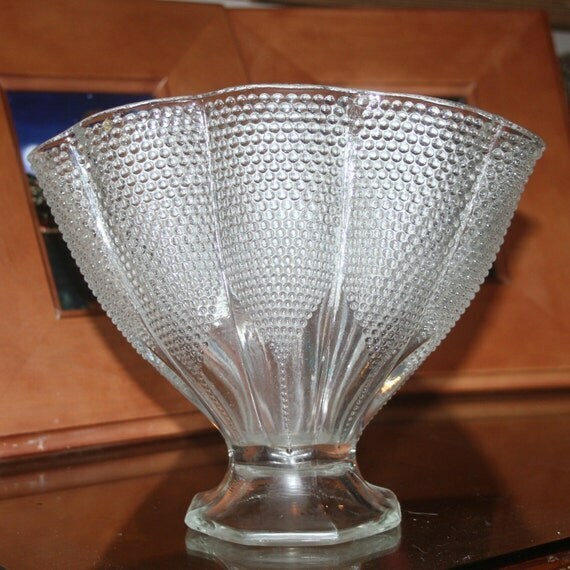 This depression glass is vase is magnificent and would enhance the beauty of any flowers. The shape and intricate design are stunning and unique. According to Replacements.com, this was manufactured by Smith Glass Company between 1940 and 1958. It measures approx 8.25 inches tall and the length of the opening is 10.25 inches from end to end. The foot or base is 8-sided and measures 4 inches by 4 inches. Later the Smith glass company is manufactured by Fostoria Glass Company. This entry was posted in http://feedproxy.google.com/~r/JujubefunnyFinds/~3/J_sBlOvXSYI/depression-glass-vase-pillow-fan-shape-l and tagged IFTTT. Bookmark the permalink.